With greater awareness and interest in Branded Residences, more are being constructed in major cities in the Asia Pacific, including Singapore, Kuala Lumpur, Bangkok and Manila. 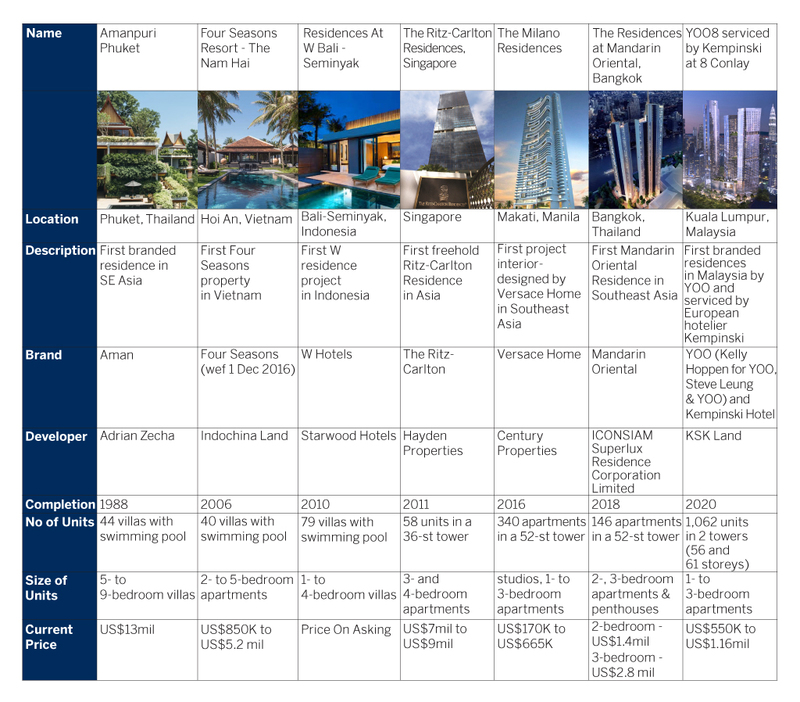 The Singapore office of List Sotheby’s International Realty (List SIR) has released its latest research paper on branded residences. Titled “LIVE BRANDED: The Rise of Branded Residences”, the paper gives the reader an overview of the branded residence market, the latest trends, as well as the growth of the market in Southeast Asia. Branded residences first evolved through the partnership of luxury residences with hospitality brands, where the brand name of a hotel is licensed for use on the residence. The hotel operator may also form a more intimate alliance with the developer to provide a full range of services and activities. Although branded residences have been around for nearly a century, it was only since the 1980s that the market has grown significantly. North America is the largest market for branded residences with a 32% market share, Asia Pacific comes a close second with 30% while Europe is third with 13%. “The branded residences concept is believed to have started as early as the 1920s with Sherry-Netherland Hotel in New York which successfully operated its serviced apartments alongside. However, it was not until the 1980s when The Four Seasons Hotel successfully sold its Four Seasons Place condominiums that the prestige of brand association became significant. Four Seasons then established its global presence through the purchase of the Hong Kong-based Regent International Hotels portfolio in 1992. The Ritz-Carlton followed suit and by the turn of the millennium, other leading hotel operators such as Starwood, Fairmont, Kempinski, St Regis, Mandarin Oriental and others also entered the market. In Southeast Asia, the successful sale of some 30 villas of Amanpuri in Phuket in 1988 led to the subsequent evolution of the Aman brand, the first branded residences in Southeast Asia. In 1995, the launch of Four Seasons Chiang Mai introduced Thailand’s first branded residences in collaboration with an international hotel chain. Since then, branded hotel chains continued to develop and has remained the most dominant form of branded residences in the region. For those who dream of having the best in luxury living from iconic buildings by starchitects, interior works by top international designers, to five-star services and amenities, a branded residence is the perfect answer. In light of new entrants in the market, the meaning behind branded residences has taken on an expanded definition in recent years. By marrying residential real estate with brands from other sectors such as luxury fashion brands such as Armani and Bvlgari, jewellery, interior design and automotive brands such as Porsche, new forms of branded residences have evolved. A brand is a stamp of quality recognised and cherished by buyers, and is one that commands a premium. It was reported that buyers were willing to pay premiums of up to 132 percent in Bangkok and 69 percent in Kuala Lumpur over non-branded dwellings. With a growing market and higher expectations from consumers, branded residences will have to continually differentiate themselves in order to be able to attract investors and maintain their premium over luxury residences. One of the newest branded residences in the market is currently in construction in Kuala Lumpur, Malaysia. YOO8 serviced by Kempinski features not one but two power brands – international design studio YOO founded by John Hitchcox and Philippe Starck and Europe’s oldest and most established hotel group, Kempinski, which was founded in 1897. YOO8 serviced by Kempinski is part of 8 Conlay by Malaysian developer KSK Land, and features interior concepts by Steve Leung and Kelly Hoppen of YOO studio and in-house services by Kempinski. Situated in the heart of Kuala Lumpur City Centre or KLCC, its two residential towers are set to become the world’s tallest twisted twin towers upon completion. If you are searching for branded residences but are ensure of funds availability for purchase, our mortgage consultants at iCompareLoan can set you up on a path that can get you a home loan in a quick and seamless manner. Our consultants have close links with the best lenders in town and can help you compare Singapore home loans and settle for a package that best suits your home purchase needs. You can find out more about our money saving tips here. Whether you are looking for a new home loan or to refinance your existing one, our Mortgage brokers can help you get everything right from calculating mortgage repayment, comparing interest rates, all through to securing the best home loans in Singapore. And the good thing is that all our services are free of charge. So, it’s all worth it to secure a loan through us.